The GoSun Stove is the highest quality cooker in its class! 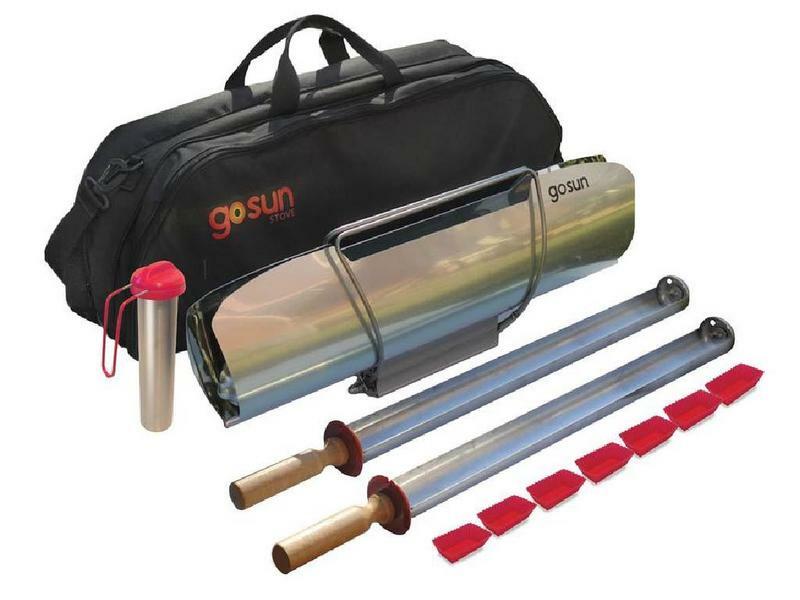 Top of the Evacuated Tube Design, the GoSun Stove provides a new take on solar cooking with increased speed and functionality not yet seen in the solar cooker world. 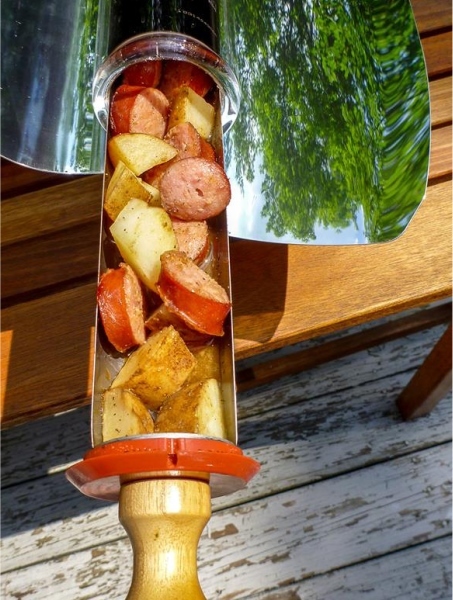 Developed by Patrick Sherwin after years of trial and error have accumulated into the best evacuated tube cooker we have ever used and tested in our ongoing search for new and effective solar cookers. 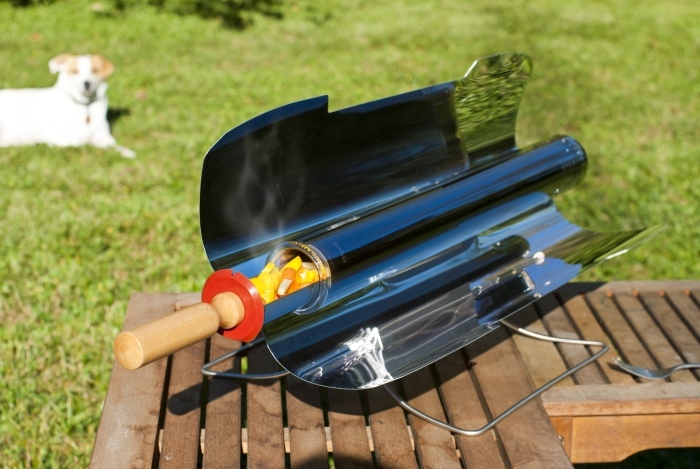 The GoSun Stove is a unique solar cooker in its design and in its capacity to cook very fast. 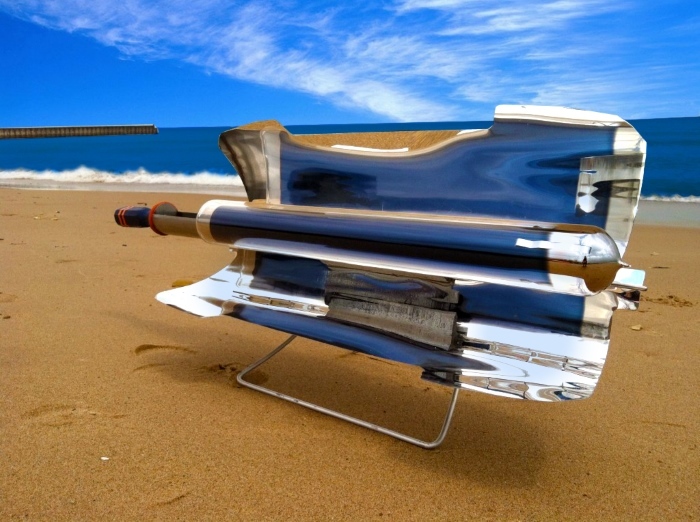 The evacuated tube design cookers are known for being able to reach very high temperatures quite quickly and they are also a more compact cooker than most other solar cooker designs. The American consumer is always looking for compactness and portability in their gadgets and so this would make the GoSun cooker a candidate when considering solar cookers. This GoSun Stove is what I would term, the microwave of the solar cooking world, reaching temperatures in excess of 500 F in a very short time and retaining it throughout the cooking process. The evacuated tube design has an advantage in that it holds and retains its heat better than any other style of solar cooker, and it will heat up quite well even in less than optimum conditions. -However, one significant difference with this particular style of cooker is that it does not have a real large cooking interior compared to that of a box style or panel style solar cooker and regular pots and pans cannot be used at all in this kind of cooker. -This can be a plus or a minus, depending on how you look at it and what you want to use your cooker for. --This cooker is more like your microwave, and like your toaster oven, compact, quick and does not take up a lot of room. 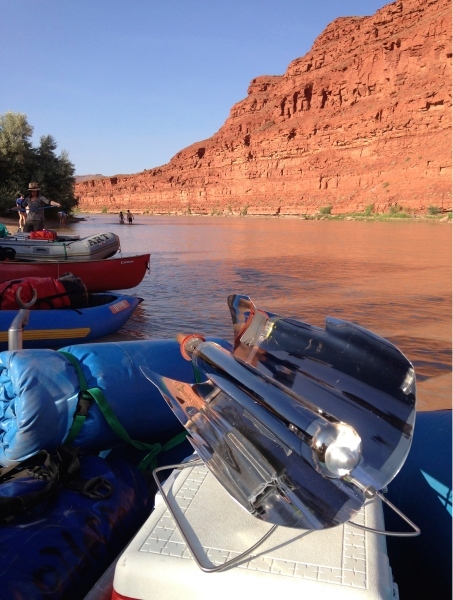 ---An Ideal solar cooker for those who are on the go, or want a quick, convenient hot meal. This cooker uses a tray like food receptor that slides inside of the long evacuated tube and it is quite narrow, so it can be somewhat limiting with regards to the kinds of foods that can be more readily cooked. That being said, I have cooked, and I have seen many others cook everything from sausages, small cut up roasts, steaks, seafood, chicken, hot dogs, hamburgers, french fries, as well as veggies of all kinds. Breads, rolls, and muffins can be cooked in the GoSun Solar cooker with the stipulation that you need to sometimes change the size and portion of the food you put into the cooking chamber. The power of this little three and a half pound (1.5kg) portable device can easily be underestimated. Meals can be ready to eat in just 10 minutes. Temperature can be adjusted from 200°F (93°C) to a maximum cooking temp of 550°F (288°C). The standard package includes a durable borosilicate, evacuated glass tube cooking chamber, two foldable parabolic reflectors that protect the tube like a clam shell, a stainless steel cooking tray with handle for getting food in and out, a rugged cleaning scrubby (attaches to the end of the tray, to double as cleaning tool), and a carrying handle that unfolds to become a set of support legs, which can be used to adjust the tube to face the sun in any position along two axis’. 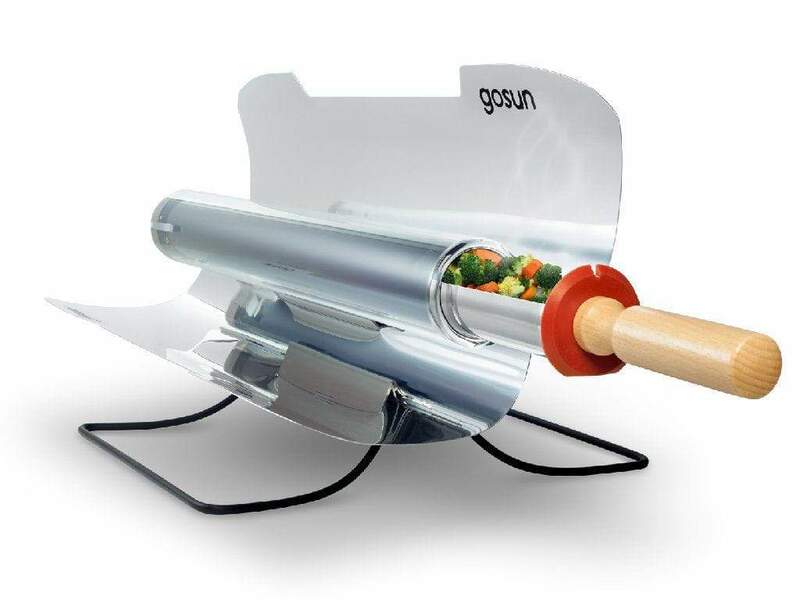 GoSun Sport solar cooker is the world's most practical and efficient solar oven on the market today. GoSun's parabolic, tubular design works effectively in retaining 80-90% of all sunlight that is caught in its footprint. Cook a meal in less than 20 minutes, using no fuel – only sun. The GoSun Mini is a great travel size alternative to the classic GoSun Sport solar stove. With its small size, comes intense heat! This ultra-portable Mini cooker can quickly sizzle over 400° F cooking temperature in just 5-10 minutes, using nothing but the sun. Perfect for roasting garlic, cashews, peanuts, hot dogs, sausages, pumpkin seeds, trail mix, or any other small appetizer or snack. Great as an educational tool, or as an intro to solar cooking. Makes for an awesome, unique gift for the guy or gal who has everything. You can also buy the GoSun Sport Pro Pack which includes a padded carrying case for secure travel, an extra cooking tray for prepping your next dish, non-stick silicone baking pans for easy cleanup and the brew accessory to boil water.